Can you imagine, what must have been the first deadly weapon that allowed a man to kill wild animals, far superior in running speeds to him from a distance or remotely, or for that matter kill or at least seriously injure, his enemy remotely from a distance. It was a simple sling. Slings are believed to have been used by Neolithic or even Upper Paleolithic people of the stone age. The bullet or shot that would be fired from this weapon was always a stone. The ancient people of Harappa civilization in India, had realised that if they could modify this sling stone bullet or a shot to a perfectly spherical shape, it was vastly superior in speed and more deadly. 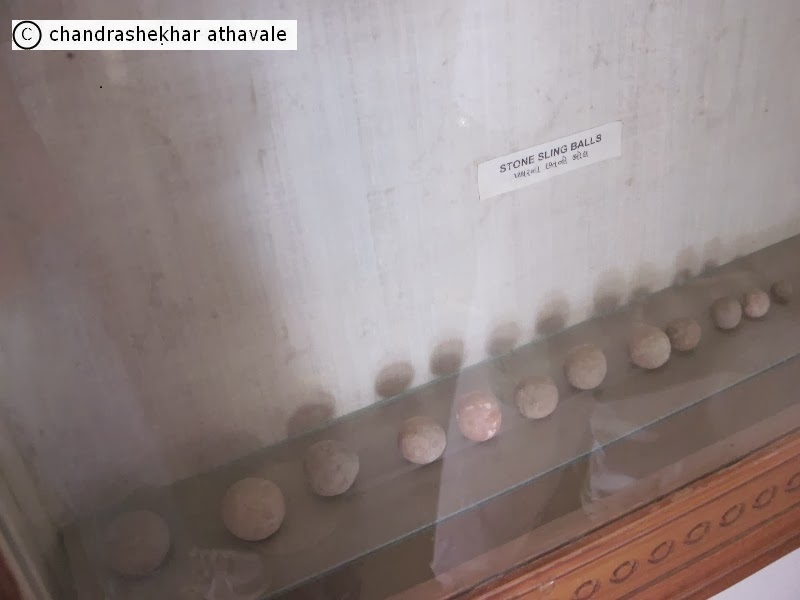 I have seen such perfectly spherical sling bullets or shots from a period of around 2500 BCE at 'Dholavira' archaeological museum, in the Gujarat state of India. Now what is a sling? A sling has a small leather pouch in the middle of two lengths of cord. The shot is placed in the pouch. The middle finger or thumb is placed through a loop on the end of one cord, and a tab at the end of the other cord is placed between the thumb and forefinger. The sling is swung in an arc, and the tab released at a precise moment. This frees the projectile to fly to the target. The sling essentially works by extending the length of a human arm, thus allowing stones to be thrown much farther than they could be by hand. Any high school physics book would tell us that for an object in a circular motion, its speed or velocity is directly dependent upon the radius of the circle in which it is rotating. In case of a sling, higher is the speed, more lethal it is bound to be. The sling dramatically increases the radius of the circle in which the shot is being rotated before it is released. So why am I talking about slings and sling shots today? The reason happens to be the India's latest spacecraft named as MOM or Mars orbiter Mission, that is hurtling towards planet Mars, since 1 December 2013. But whey India needs a sling shot, when other countries like USA are simply launching their Mars missions directly? The problem origins with non availability of a proven large rocket in India that can do this job. Indian space scientists have only their proven work horse PSLV rocket, that can lift the Mars spacecraft all right, but can not give it the speed or velocity required. But why do we need to give a certain velocity to the spacecraft? Would be the next logical question. The answer to that is the gravitational pull of the earth, which keeps all of us including our atmosphere earth bound. So, like a stone thrown up falls down eventually, any spacecraft sent up by a rocket would eventually fall back to earth, unless it has a velocity higher than a critical velocity of 11.2 Km per second to escape from Earth's Sphere of influence or SOI and India's PSLV rocket can not give this kind of velocity to a spacecraft that weighs more that 1300 Kilograms. The Indian space scientists therefore looked at some other method to impart this kind of velocity to the space craft. On November 5, 2013, ISRO successfully managed to place the Mars orbiter into a near earth elliptic orbit with farthest distance (Apogee) of 23000 Km from earth. This speed of the spacecraft was not enough to impart escape velocity to it. The velocity of the spacecraft was progressively increased by firing on board rocket motors 6 times to increase the farthest point (Apogee) to roughly to two hundred thousand Kilometers from earth, which meant that now it had enough velocity to escape from earth/s gravitational pull. To release the spacecraft from the earth's orbit, it was re oriented and the on board rocket fired it to move tangentially to the orbit. This 23 minute long engine firing, finally imparted a velocity of 11.4 Km per second to the spacecraft and it is out of the clutches of the mother earth. 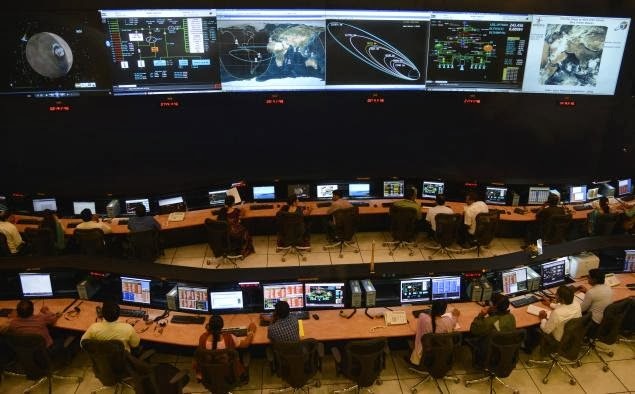 ISRO says that the orbiter is now in a hyperbolic orbit and it will escape from the sphere of influence (SOI) of the Earth at 1.15AM of December 4. The SOI of the Earth extends to about 9.25 hundred thousand km from the Earth. Once it is released from earth's SOI, it would be picked up by the Sun and it would enter into a perfectly sun-centric elliptic orbit like that of a comet. Moving on the sun-centric orbit, Mars orbiter is expected to near the Mars's SOI after about 300 days, when the on board engine would be fired again. The spacecraft would then be actually slowed down so that Mars starts influencing it with its gravity and it finally starts orbiting around it. The spaces here are enormous and calculations needed are extremely complicated, yet the physics that was behind a sling shot released by an Harappan man 2500 years ago and release of the Mars orbiter by an on board rocket firing remains exactly same. The scales are widely different and that is why ISRO calls the release of Mars orbiter process as Mother of all sling shots. Nevertheless a very apt description. * T-Minus one hour and counting for today's TCM. * Yes it’s 4:30 PM now. MOM TCM2 firing should have started-Confirmation awaited from MOM. * Confirmation signal from MOM can be received only after the antenna is reoriented towards Earth,post-firing;and of course the signal delay. * A missive from MOM confirms the TCM2-Firing completion as planned. Team MOM is busy crunching numbers to determine the post-TCM2 trajectory. *Mars Orbiter Mission’s second Trajectory Correction Manoeuver completed successfully. Keep Cruising MOM ! All this means is that MOM is now on the right path to Mars.